While American literary history has long acknowledged the profound influence of journalism on canonical male writers, Sari Edelstein argues that American women writers were also influenced by a dynamic relationship with the mainstream press. From the early republic through the turn of the twentieth century, she offers a comprehensive reassessment of writers such as Catharine Maria Sedgwick, Harriet Jacobs, and Charlotte Perkins Gilman. 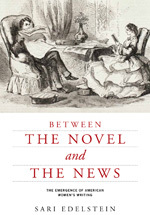 Drawing on slave narratives, sentimental novels, and realist fiction, Edelstein examines how advances in journalism—including the emergence of the penny press, the rise of the story-paper, and the birth of eyewitness reportage—shaped not only a female literary tradition but also gender conventions themselves. Excluded from formal politics and lacking the vote, women writers were deft analysts of the prevalent tropes and aesthetic gestures of journalism, which they alternately relied upon and resisted in their efforts to influence public opinion and to intervene in political debates. Ultimately, Between the Novel and the News is a project of recovery that transforms our understanding of the genesis and the development of American women’s writing.